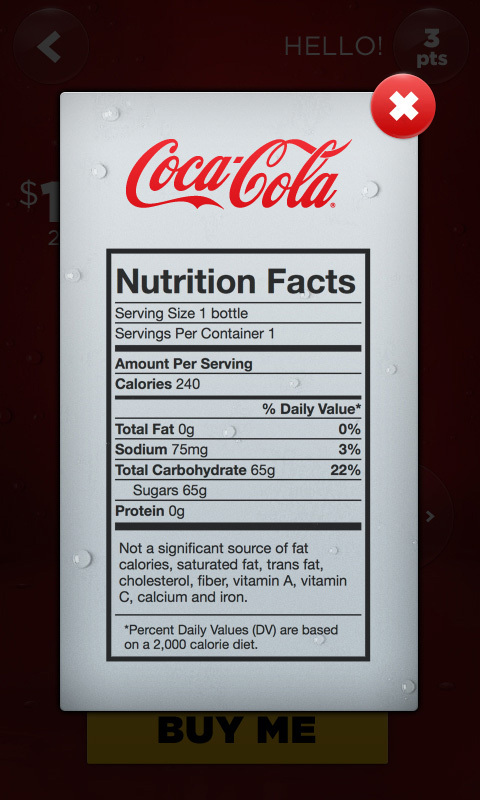 As Coca-Cola planned to update millions of their vending machines to accept cashless payments, they brought on Odopod to design the interface for the display being added onto their machines. The goal was to make credit card and mobile transactions seamless and easy, while also giving customers access to nutritional information, and encouraging them to participate in Coca-Cola’s reward program. I was involved in project strategy, and helped plan and build parts of the user experience flows, but my main role was to visually design the entirety of the user interface. This included establishing the project visual style, creating all of the graphical assets, and designing the pages and states comprising the interface. When designing Coke’s vending interface, I wanted to create a remarkably straightforward experience that gets customers to their goal in the least number of steps possible. Simultaneously, I strived to make every part of the interface exude Coca-Cola’s visual brand in a captivating and refreshing way. I peppered the whole experience with visual elements and colors intended to stimulate & awaken peoples' intrinsic desire to feel that signature “Ahh!”.